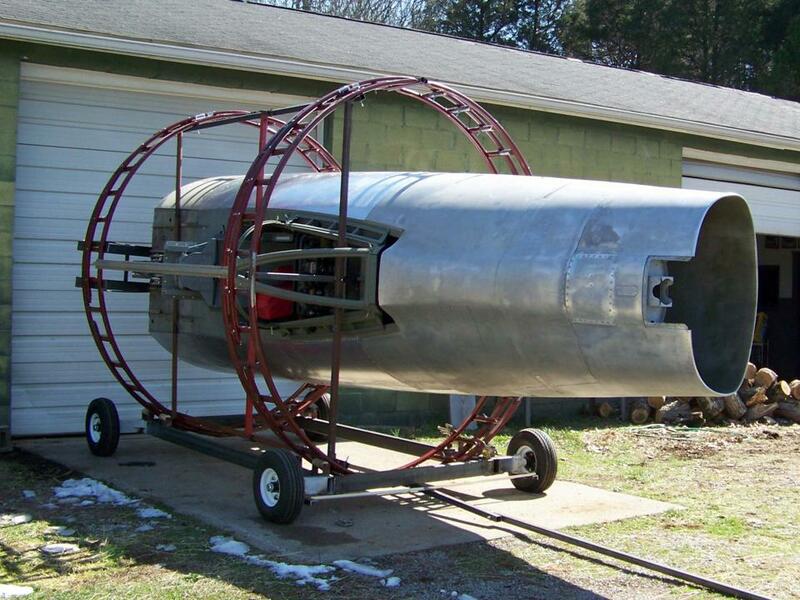 One of the more complex fuselage components is the gun bay door. 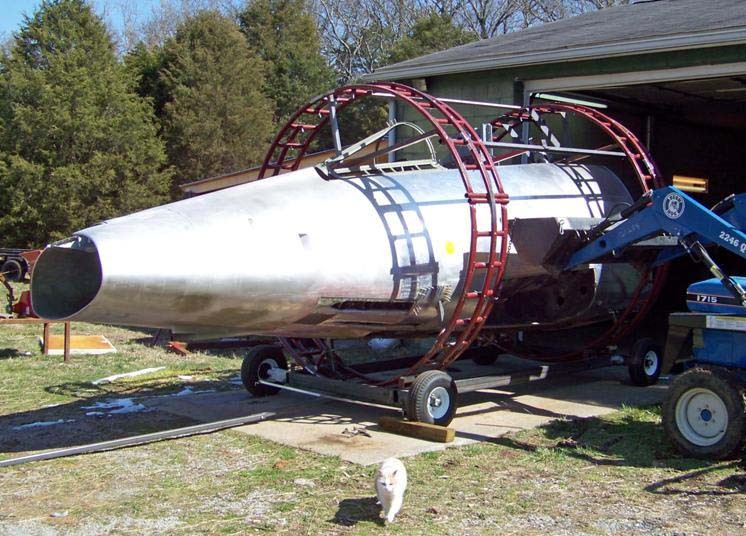 Fortunately, Dean Demmery, the Carolinas Aviation Museum's curator, had given me permission to trace any and all parts of the F-100D he was restoring. (You can check the tracing work Mark Brown and I did by looking at the Fuselage Part 4 page.) 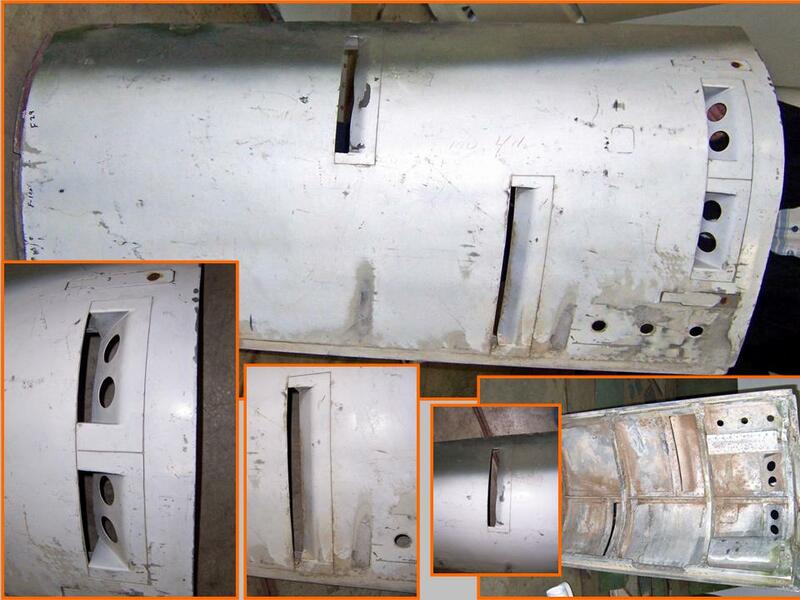 We also took over 100 pictures of the fuselage components and details. The structures you see in the gun bay door are vent and purge openings. Note that the openings have an angled baffle at the back of the opening. The purpose of these baffles is to create suction as the slipstream flows over the door. The holes at the back of the door purge the link bay. 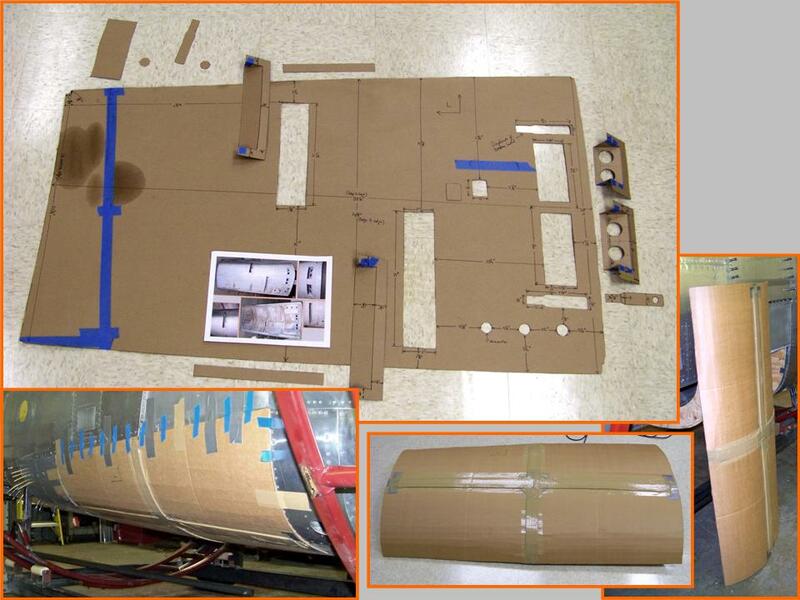 In Fuselage, Part 5, you saw the design and manufacture of the roll cage. It was now time to put that design to the test. 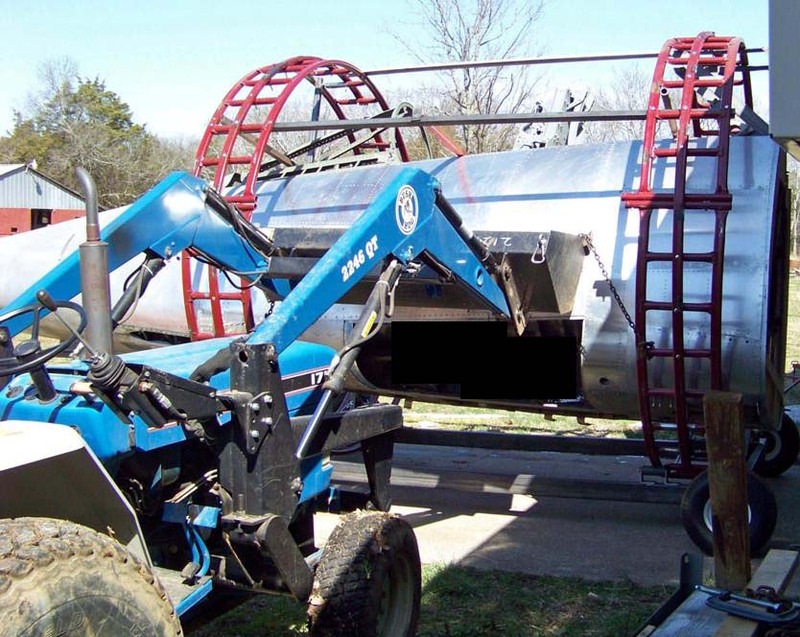 Just to make very sure that the roll cage would not flex, Steve had welded additional braces to the roll cage structure ... and that extra caution took a load off our minds as the tractor front loader was used to roll the whole cage -- with the fuselage inside it -- on its rollers. To roll the cage, we threaded a chain through the lower cage bars and then locked the chain over the tractor's front-end loader. Lifting the front end loader would roll the cage. Naturally, when we ran out of vertical lifting space for the loader, we had to remove the chain, re-thread it through the lower cage bars, and repeat the process. Each repetition gave us a maximum of about 20 degrees of roll. The pictures in Figure 2, cells 01-03, illustrate the process. The pictures in Figure 3, cells 01-03, show the progress on the spine section. Thanks to the tracings supplied by Pete Felts, I could finally complete most of the spine segments. Pete will trace the two sections just aft of the canopy during the next few weeks and then I can begin the challenging job of getting the entire spine portion done. 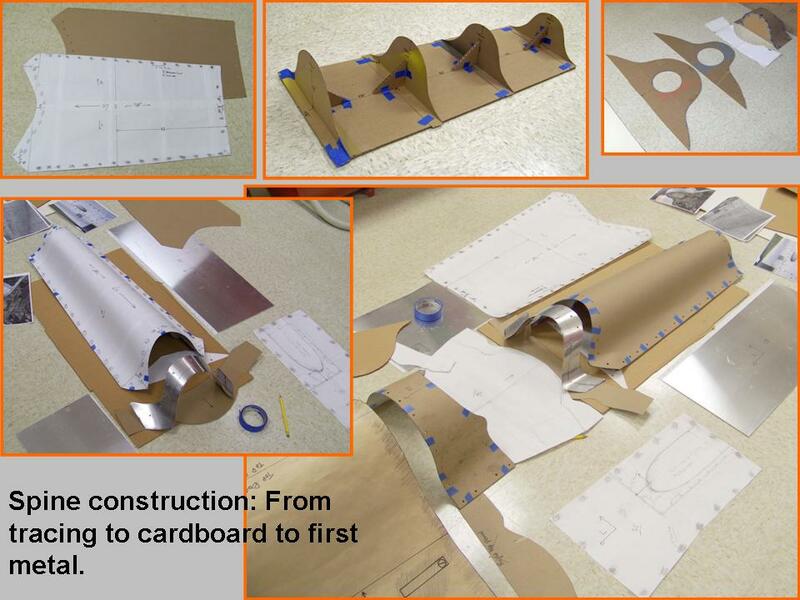 At this point, I'm working on the Ram Air Turbine (RAT) section ... and I'm converting the cardboard into metal. You will see the progress after I do the next update of this page. 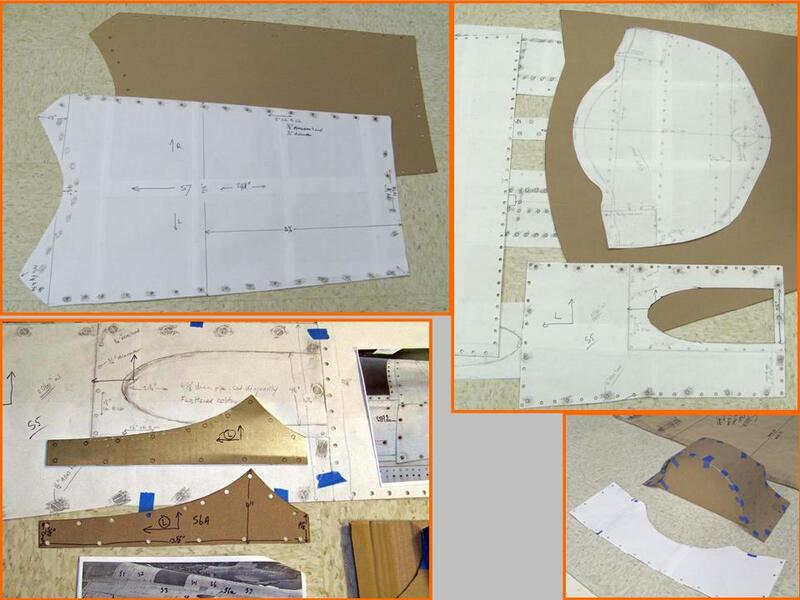 You saw in Figure 3 that the paper tracings and cardboard models became the basis for the aluminum panels shown in cell 03. 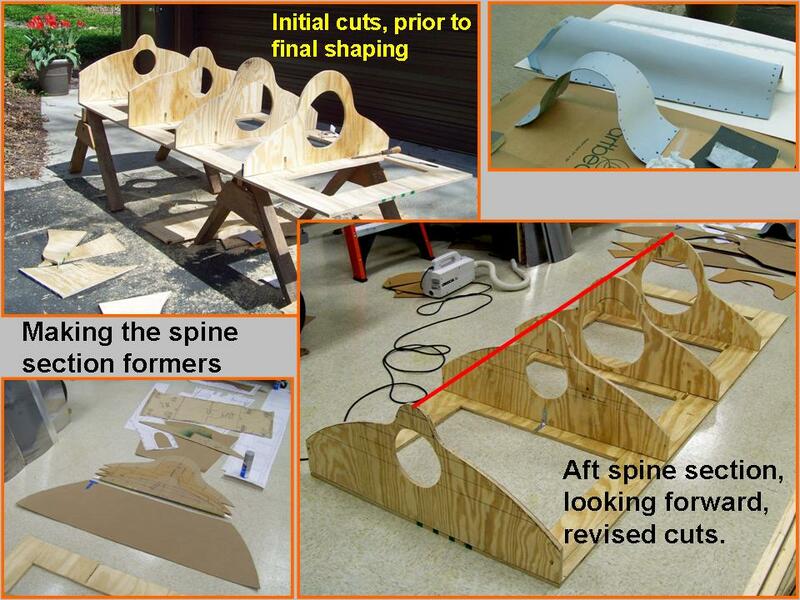 That work was challenging enough ... and now it was time to make the plywood formers that would define the spine shape. The problem was that the spine section curvatures were pure guess work -- initial cardboard cut-outs were, to put it charitable, well off the mark. However, after multiple false starts and even more numerous corrections in the "almost right" heavy cardboard formers, I finally felt sufficiently confident to transform the cardboard into plywood. Figure 4, Cell 02 shows additional spine panels and some of the many metal stringers that would be used to form anchors on the plywood forms. 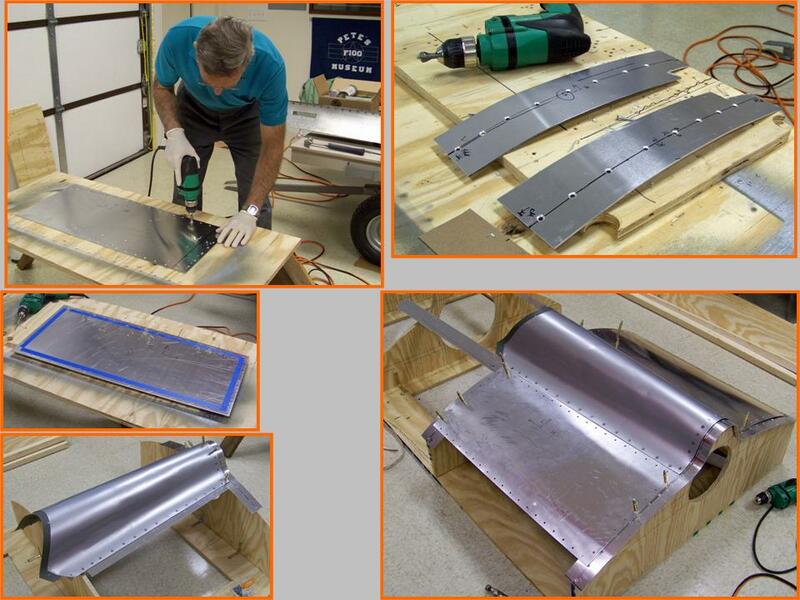 These stringers would also be the way to attach the skin panels to the (plywood and metal stringer) frame. 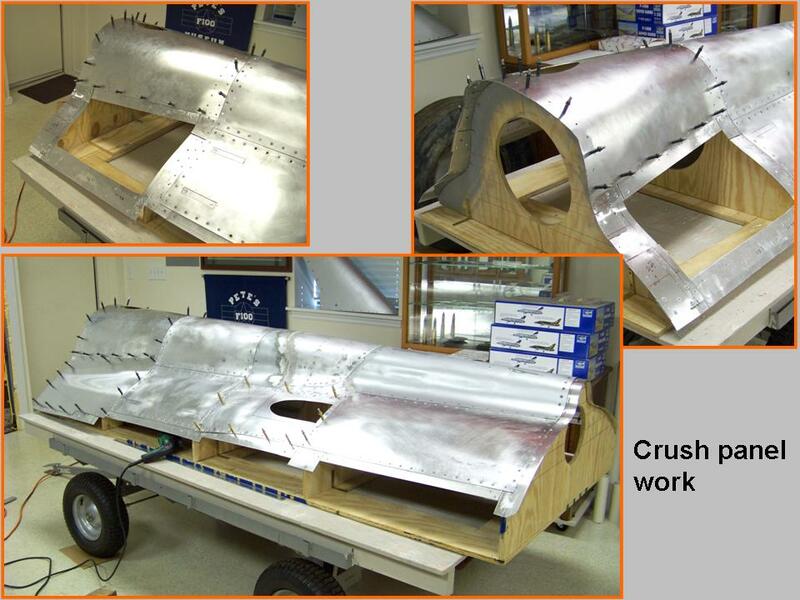 The lower right-hand panel in the composite picture shows that progress has been made! Cell 03 shows a completed spine section ... finally, a very good fit. 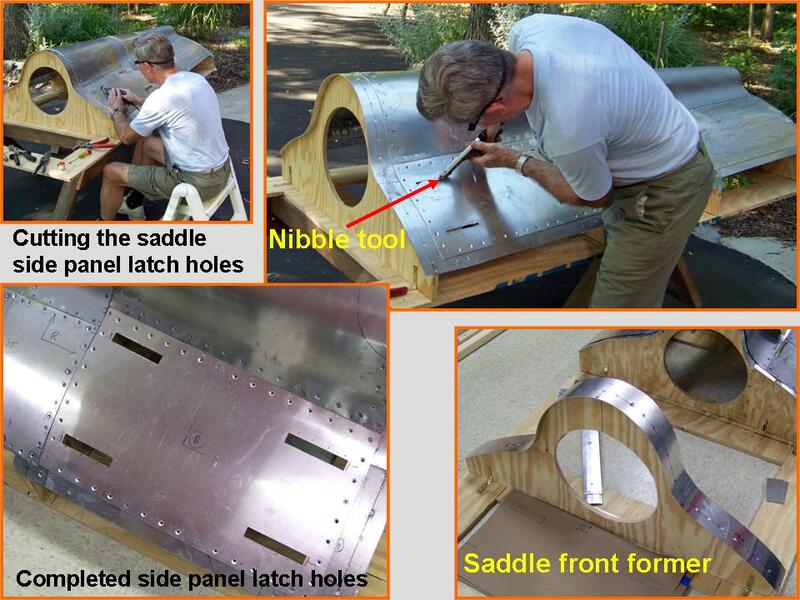 Given the fairly complex multi-directional bends in the RAT (Ram Air Turbine) panel and the center section of the saddle, I spent some time trying to devise ways to get those bends "just right." During the search for the right bending tools and techniques, I did a lot of experimenting ... and discovered that trees of varying trunk thicknesses make VERY effective bending tools. 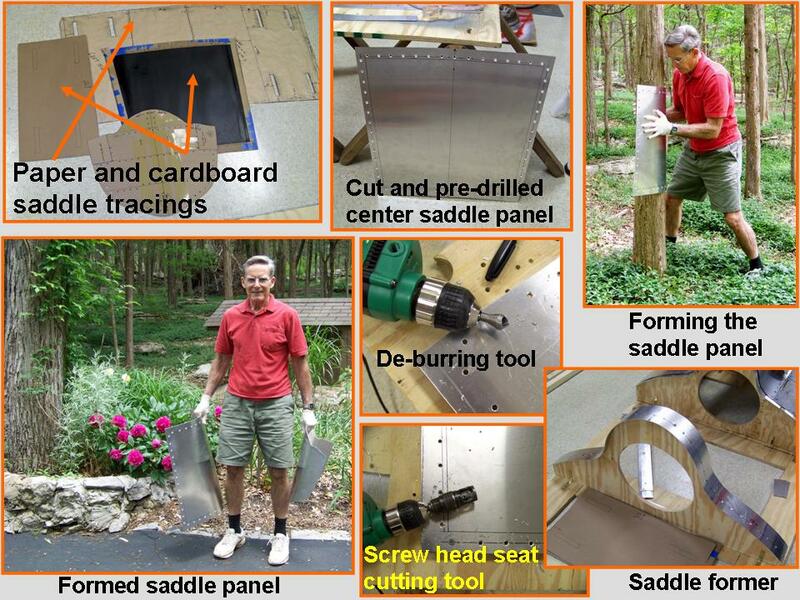 Therefore, shaping the RAT and center saddle sections turned out to be less of a problem than I had feared. (Cedar trees have nice, smooth trunks, so they turned out to be really good "tools.") I also discovered that the sharper bends at the edges could be handled by pounding them with a rubber hammer across a 4-inch section of heavy PVC pipe. 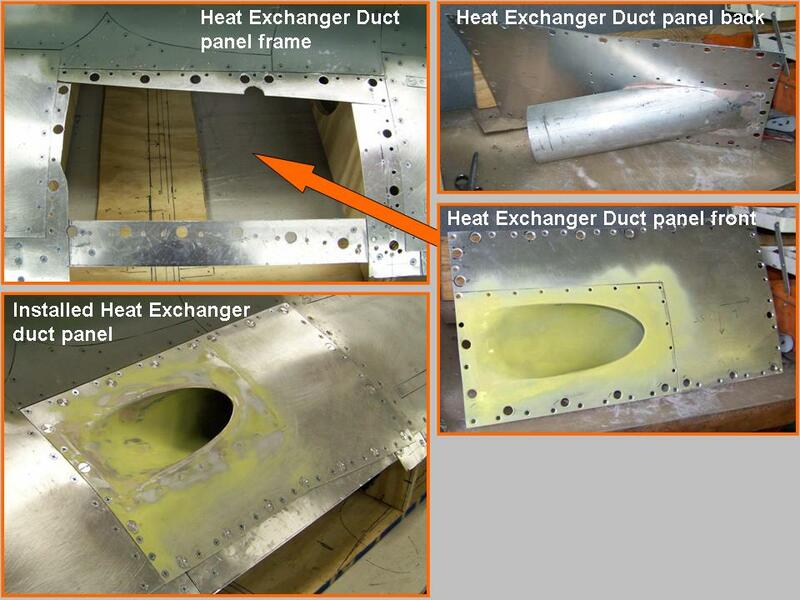 Figure 5, cell 6, Heat Exchanger Duct (HED) panel openings, but much work remained to be done to make and install the duct tube. 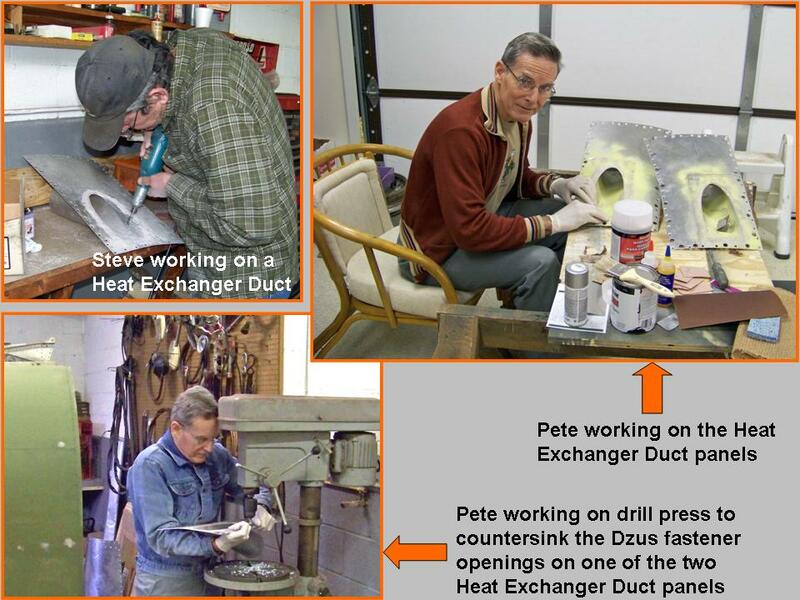 Fortunately, Steve had found a piece of aluminum pipe that had an "exactly-right" diameter and wall thickness. 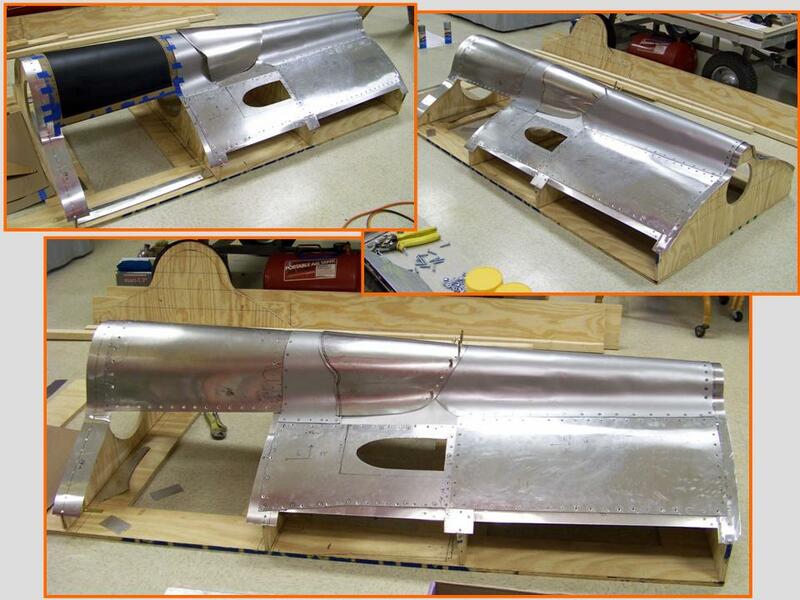 Steve proceeded to cut the pipe section diagonally to match the correct installation angle and then hammered the aluminum pipe into shape to flare the pipe end into the back of the HED panel. He then welded the exhaust pipe to the panel and then used Bondo to seal the edges. 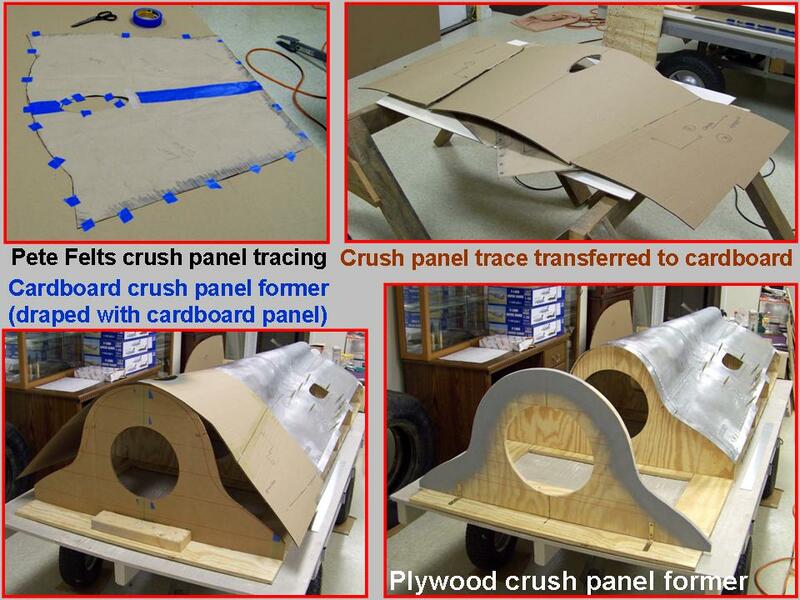 Although I had cut, shaped, and drilled the HED panel, much work remained to be done. 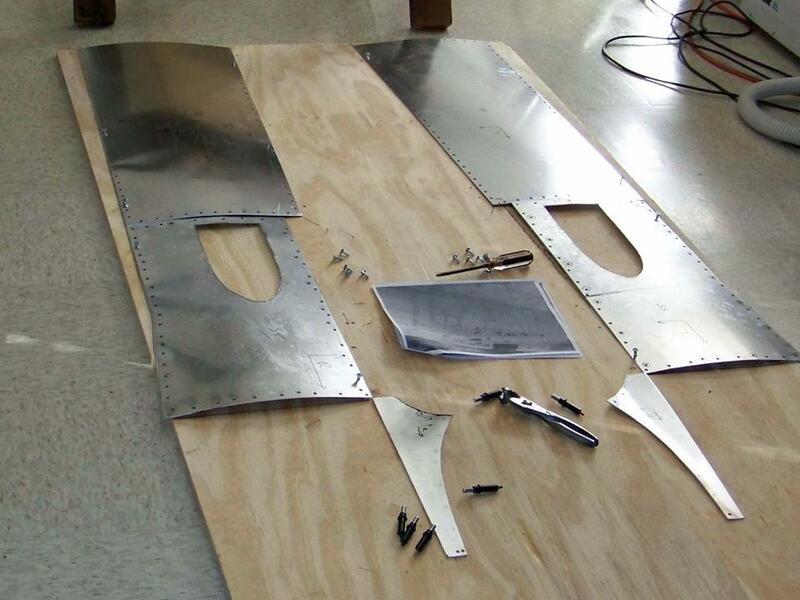 First, the photos and the paper rubbings that I had made showed that the HED panels are fastened to the fuselage frame with 9/16" flush-head Dzus fasteners. Therefore, I had to widen the drilled holes and counter-sink them to match the Dzus heads, thus ensuring that the Dzus heads were flush with the panel skin. I had used the 9/16" Dzus fasteners before -- but I discovered that I had only eight left, far too few to finish the HED panels. No problem, right? Well, not exactly ... First, none of the Dzus fastener manufacturers or suppliers bothered to list the Dzus head diameters. Yes, grip length, diameter, and collar measurements were there ... but the only important thing for me was the correct head diameter. It took me (too many!) hours of Internet cruising and multiple email contacts to finally find a supplier who was able to actually give the required information and to help me find the correct fasteners. Bless Jeremy Summers at www.milspecproducts.com ... who was the only person willing and able to provide precise information and who then spent some time on the telephone with me to ensure that I would get the correct fasteners. Mr. Summers also agreed that the Dzus head diameter size whould be listed on the website's product specification list and that he would make that happen. 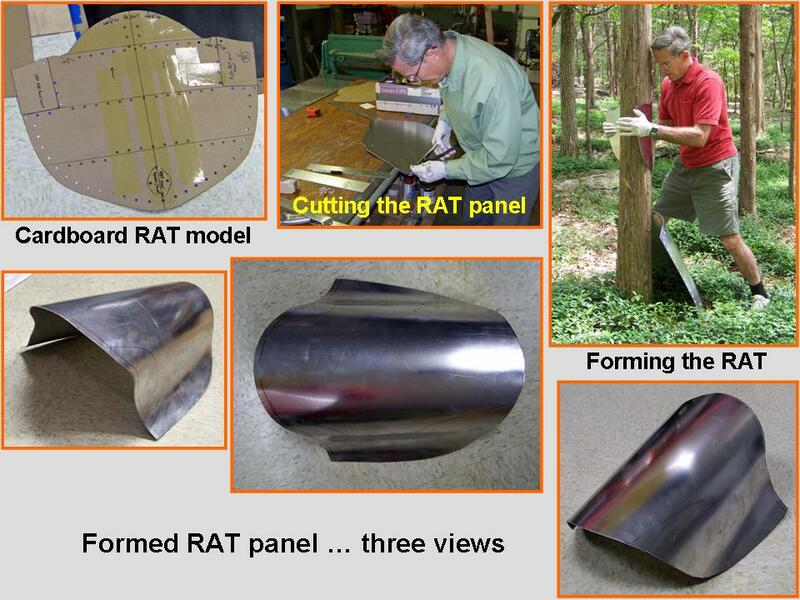 Note: In the original description of this HED panel, I used the label �RAT exhaust panel.� My source for that label was one of the many Hun books in my library. Pete Felts provided the following comments, which served to correct my misidentification. Comments by Pete Felts: I fear I must correct you on what those ducts are for. If I'm not mistaken, they connect to the heat exchanger under the saddle. The RAT is a straight shot right from the intake. There is a door on the inside of the intake that opens when the RAT is actuated; the handle to open the RAT is located under the right canopy rail. In contrast, the Heat, Vent, and Pressurization are maintained by the heat exchanger from the 16th stage of compression. Those ducts cool the air down to make it manageable. The heat exchanger looks like a big stainless steel box with a radiator attached to it. I really don't know what the correct nomenclature of that panel would be, but I'm sure there is one. However, if I had to suggest a label, it would be Heat Exchanger Duct. This duct does not exhaust air. Instead, it is the source of fresh air that is used for pressurization and temperature control. The 16th stage of the compression supplies heated air to the Heat Exchanger to warm up the outside air, which is then vented through the bleed air valve on the left side of the airplane, back by the splitline. Although the work on the spine section had been completed by the self-imposed deadline, the completion of the HED panel took much longer than expected. 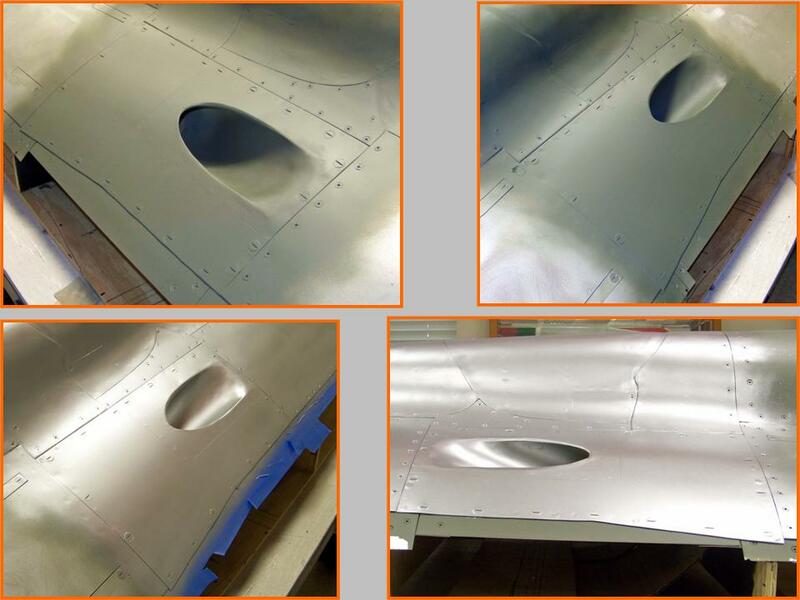 I had been side-tracked with the work on the aft fuselage section's frame work ... so the HED panel work had been on hold for a few months. But the main problem was finding a good way to make the HED, which turned out to be a major project by itself. Never mind ... progress is being made. 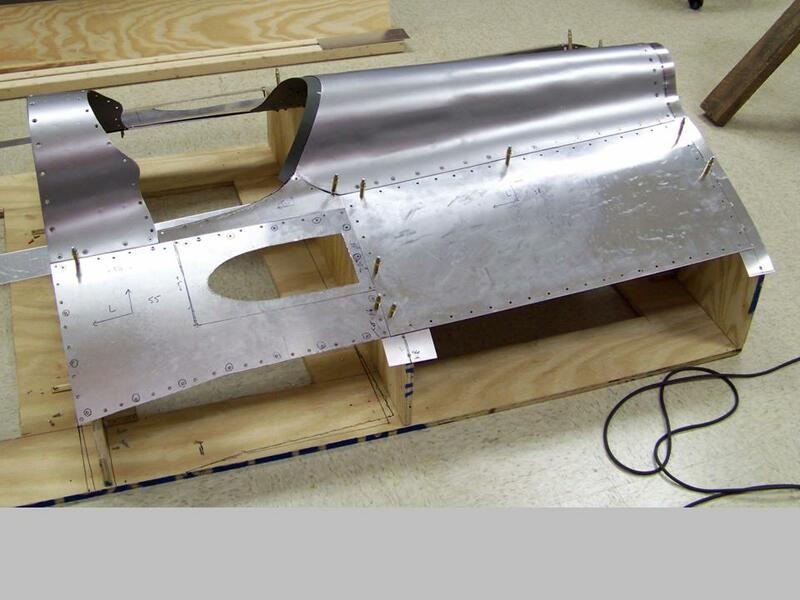 As the work on the spine section and the fuselage below it progresses, Steve and I will continue the work on the fuselage bottom panels. 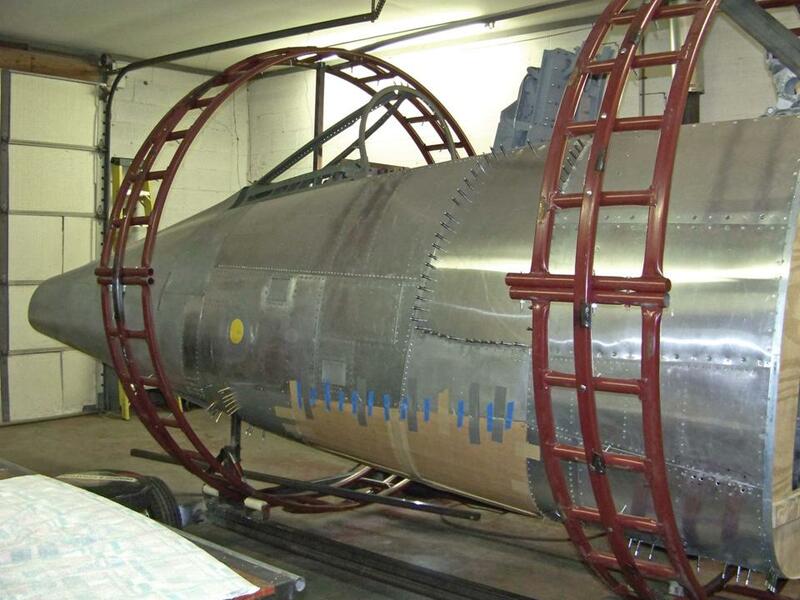 The Fuselage, Part 7 page will show how that part of the project is progressing.